Helix LS Zip - Mens is rated 4.8 out of 5 by 41. Rated 3 out of 5 by Threesheets from Merino Not Quite So Lofty. While the jacket is very warm for its weight I found the appearance to be below Icebreaker standard. It just doesn't look high quality. And the sleeves were a bit short rendering the thumb holes useless. But my wife seems to like it-she steals it all the time. Rated 5 out of 5 by Ilikedirt from Quality over quantity I’d much rather pay 300 for a jacket that will last forever than 50 on a new jacket every couple years. Comfortable lightweight yet warm. Best jacket I’ve owned. Rated 5 out of 5 by GoKiwis from Base or outer layer... Great wind block and perfect for windy cool, not cold, days. This with a 200 long sleeved crew was awesome on a breezy 5 degree C day. I am 5'11" and 160 lbs. The medium is fine with the 200 but anything thicker or two layers beneath and you'll need a large to be able to move your shoulders. Rated 5 out of 5 by TheGenie from Winter mid-layer and spring outer-layer I think this is my new favourite top. It looks sufficiently smart that I’m tempted to save it for more dressy occasions than playing outdoors. But with its extra insulation it makes a fantastic winter mid-layer and in spring it will be a perfect outer layer. It has a warm, snug comfortable fit, and long sleeves with thumb loops for those times when you really want your top to give you a hug. The outer shell can get you a little humid if your sat inside in the heat, but the length zip means you can adjust your ventilation. It’s a great multi-use top. Rated 5 out of 5 by Trichick24 from Looks great dressy or casual Bought this for my husband. He’s a sporty guy but gets dressed up neat every once in a while. We travelled with this jacket recently. He loved the thinness yet warmth of the jacket and used it as a layer and stand alone. Great looking jacket that is super functional as well. Rated 5 out of 5 by Aventurer from Excellent, just excellent This is so light and easily packed, but warm and comfortable. Rated 5 out of 5 by HOW225 from Functional mid layer for skiing I have worn the Helix Long Sleeve Zip as a mid layer for both on mountain piste and free skiing. 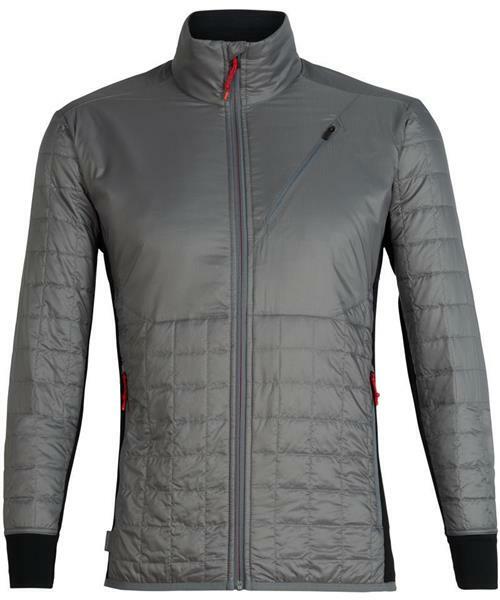 I found the product to be responsive to ski movements and was a very good alternative to down fill for warmth breathability. My only suggestion is the arms could be a 1/2-1" longer, given the thumb holes it would be nice to have a little more arm play. The mid section fit well around the body.